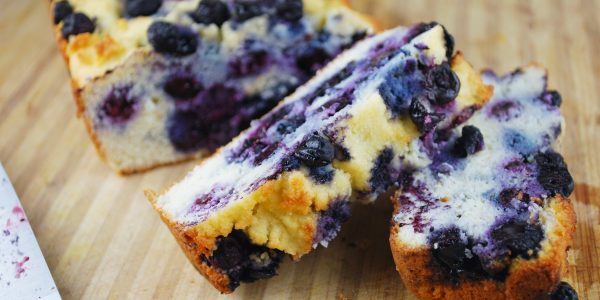 Gluten free Blueberry Cake with a hint of lemon, yum! This is the time of year to be stocking up on berries. Inexpensive and in season, blueberries are easy to freeze and save for later when you can’t get them at any price except in a can(really?…. you want some in a can….oh dear). Simply go to the store, purchase as many as you have room for ( we’re talking about every available square inch of space, they are small you know). Gently wash them then set on a towel to dry. Check to make sure a cookie sheet with sides will fit in your freezer. Place a piece of parchment paper on the sheet, gently place the berries on top. Slide in the freezer and freeze until firm,about 2 hours. Place in zip type freezer bags and pop in the freezer. Ready to go berries. Awesome job! Now on to the recipe. You can pop over here to read the directions for the recipe. Click here! You could also make these into “muffins” so you can eat them on-the-go so to speak. Breakfast anyone? P.S. Hey, we just sneaked in another “Prepper” idea for you. It was easy and painless.